I hope you've been having a great summer so far and that you've been able to make time for the summer activities you waited all winter for! I know for myself, summer weekends fill up so quickly and the time just flies. 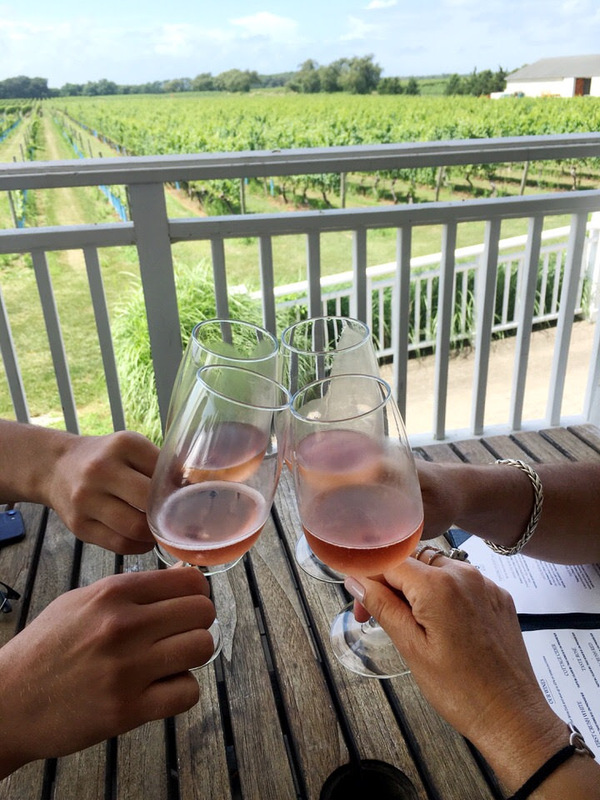 Last week I was in Southold on the North Fork of Long Island with Jeff's family for a weeklong vacation we'd been looking forward to for months. We spent the week eating, hanging out at the beach, eating, vineyard hopping, eating, cooking, playing scrabble, and eating. It was great! 2. Making Brownie Extravaganza for Jeff's family! What the heck is Brownie Extravaganza, you ask? It's basically a brownie trifle with cool whip and pudding and it's been my mom's go-to dessert for as long as I can remember. I had never made it for Jeff's family before and I loved being able to share one of my nostalgic family recipes with them. 3. Backyard lobster fest! 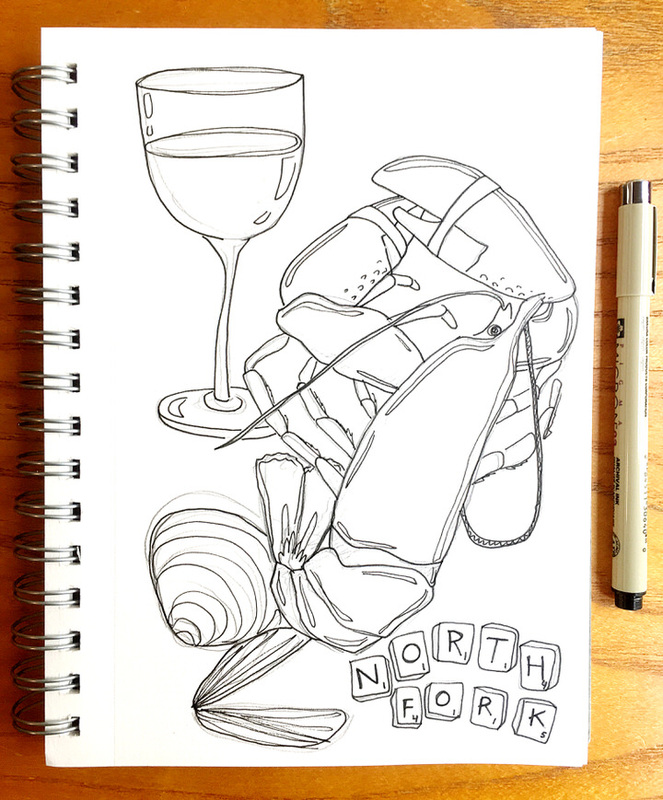 My childhood was spent land-locked in Atlanta so seafood boils and get-your-hands-dirty lobster dinners weren't part of my typical summer growing up. Seeing as Jeff's family is from Rhode Island, they're kind of lobster pros. This was my favorite meal of the whole trip, despite the mosquitoes that attacked the table toward the end of dinner. There's just something so fun about cracking the shells and dunking a hunk of fresh lobster in butter. I'm drooling just thinking about it! All in all it was an awesome trip. I got to make some new memories around the table with Jeff's family, I got to share one of my favorite family recipes with them, and I got to drink a lot of wine. If that doesn't sound like a successful summer then I don't know what does! Have you made new family memories around the table this summer? Or eaten anything that blew you away? P.S. I'm always channeling my food memories into new artwork. Click here to shop available prints! P.P.S. I'd love to capture your most treasured food memories. Click here to learn about my commission packages! DIY Day at Sowa: My First Ice Cream Painting Workshop! I'm a few days late on National Ice Cream Day (depending on whose food holiday calendar you're looking at), but I wanted to share the Ice Cream Painting Workshop I led at the Sowa Open Market a couple weeks ago. We had so much fun and every single person who came made a beautiful painting to hang in their home. There was a great mix of people who were avid painters and others who had never picked up a paint brush before. And now all of them have brand new kitchen art. It was so great that I've been invited to lead another Ice Cream Painting Workshop on September 16th! Tickets are available now! buy my painting workshop tickets now! Check out everyone's paintings below! Want to join me for the next workshop on September 16th? RSVP Below! Since it's still National Ice Cream month, I wanted to share a beautiful essay with you written by my best friend Rachel. It's a moving and wonderfully written piece about the nostalgia of running for the ice cream truck with her mom in New York City. It is also one of the feature stories in the very first issue of GRLSQUASH, a biannual women’s food, culture, and art journal. I hope you enjoy it as much as I did. I also want to introduce you to Madison Trapkin, founder of GRLSQUASH! In her own words, GRLSQUASH is the "biannual women’s food, culture, and art journal self-published out of Cambridge, MA. Our mission is to highlight the overlaps of these worlds with words, images, and recipes from our contributors. Food is the common thread connecting the GRLSQUASH community and we believe it’s the GRLs we need to shout about the most." Madison asked Rachel and me to become the copy editor and visual editor respectively and we both are SO excited to be a part of such an amazing project. I also got to contribute some of my food paintings and illustrations too! The drawings of my and my boyfriend's grandmothers and the painting of my mom that hangs in my kitchen are printed in this issue, which is so special to me! is available now for preorder!! This journal captures every single thing I love about food, nostalgia, and relationships and I know you'll love it too! As an added bonus, if you email me a screen shot of your preorder confirmation email, I will send you a FREE mini print of an illustration I created just for GRLSQUASH! order my grlsquash issue 1 now! P.S. Make sure you're following GRLSQUASH on Instagram @GRLSQUASH for daily inspiration! I don't think I've ever met anyone who doesn't like ice cream or who doesn't have happy nostalgic memories associated with it. And unlike other childhood memories, I would venture to say that the memory of hearing the ice cream truck come down the road only has happy thoughts associated with it. For me, there are few desserts that are as emotionally charged. And I think that's because the memories associated with ice cream don't stop at our favorite flavors. They involve every aspect of the ice cream experience: the excitement of your parents asking if you want to go get some, the anticipation and flavor decision making process, the race to eat it before it melts and glides down your fingers on a hot summer day. Ice cream parlors are the site of much family bonding. My favorite ice cream place growing up in Atlanta was Brewster's. There were a few locations and all of them had two walk up windows and a small patio to eat your ice cream outside. My brother and sister favored the dinosaur or dirt sundaes, but I had my usual: chocolate peanut butter chip in a cup. We spent A LOT of time there! Brewster's was my favorite, but Baskin Robbins holds a special place in my heart too. It's where we went the night before I started kindergarten, the same night I met my childhood best friend, Melissa and her parents. It's also where my family's favorite ice cream cake is from. If my Aunt Phyllis could live strictly on Evian and Baskin Robbins chocolate chip ice cream cake I know she would. I've seen her and several other family members attack a whole ice cream cake fresh out of the box more times than I can remember. At any given moment there are at least 12 pints of ice cream in her freezer. I am not exaggerating. I used to spend my Christmas break in Puerto Rico with my family and there were several years on New Year's Eve where one lucky hotel employee had the task of picking up our beloved Baskin Robbins ice cream cake to bring back for us. Here's a photo of me eating it off the tray. I definitely learned from the best. Who needs a plate right? I've painted a lot of ice cream art over the years. I think without even realizing it, I've been trying to capture my most nostalgic memories. In the moment, each bowl of ice cream or slice of ice cream cake is a simple joy, but time turns the memory into something bigger. Painting it helps turn those intangible feelings into something I can hold. I think that's why my ice cream paintings and prints are among my most popular. Ice cream is pure joy and never fails to bring up stories for people who add an ice cream print to their collection. It injects a little happiness into everyday life, and that’s what I want to achieve with my art. Art, like ice cream, should bring joy and happiness to you every single day. If all this ice cream talk is making you crave some ice cream art, you can check out my available ice cream prints HERE. You deserve to have something unique, nostalgic, and beautiful to make your house truly feel like home. Go find the piece that speaks to YOUR memories! Boston Painting Workshop: Come Paint With Me At Sowa! This Sunday, I'll be leading my first painting workshop at the Sowa Market in the South End! 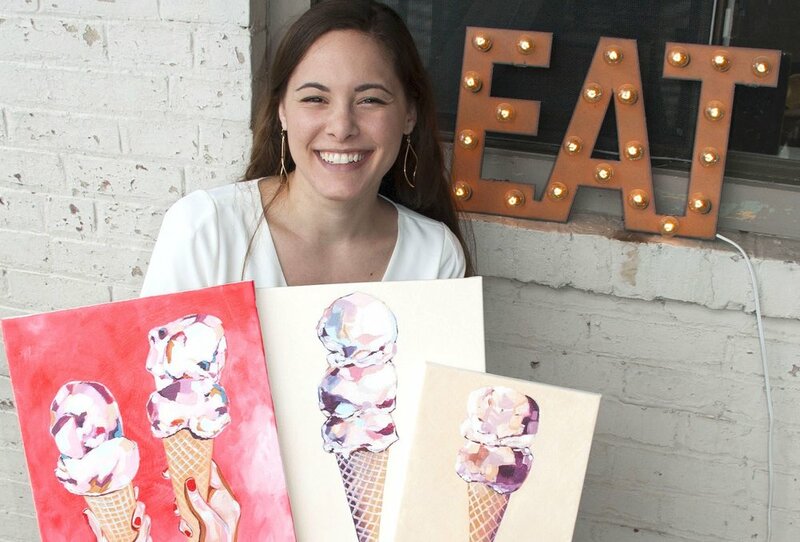 Come hang out with me and paint your own ice cream masterpiece. If you've been looking for kitchen art or just want to practice your painting skills, this is the perfect Sunday afternoon activity for you! You don't have to have any painting experience to be a part of this workshop. All skill levels are welcome. We're gonna experiment with bright, vibrant colors and you'll get to walk away with a one-of-a-kind ice cream painting that will make you smile every time you see it in your home! Afterwards, I'll be sharing your creations here on my blog to hopefully spark some kitchen art ideas!